The guitar is one instrument we all love to listen to, and some of us even have the desire of learning how to play the guitar and also pose like a rock star. If this desire is turned into perseverance, lots can be accomplished. There are different types of guitars, like acoustic guitar, bass guitar, and electric guitar. The bass guitar is mainly used to provide the bass effect in the music. You could also try playing all the chords on a bass guitar. Once you have learned the basics of playing the bass guitar, the second step in playing bass is learning how to use all the chords. Playing chords can be a complicated deal on the bass, as the strings in the bass guitar are comparatively thicker and it is hard to get the right sound. In this article, we explain some basic chords of bass guitar for beginners who have the passion for learning, and also guitarists who are in their intermediate stage. The secret to turning into a good guitarist isn’t just learning to play the guitar but to continually involve yourself in the related aspects of music and beyond par. You just cannot put down a bass guitarist to do something that is not at all important in the band, no matter what the genre of the group is. The song is sure to sound emptier compared a song which has a lining of bass if at all it doesn’t have a backup of bass sound. This instrument has motivated many musicians to learn this fantastic instrument, just like electric guitars had set the trend. People who aspire to become bass guitarists must know that the very initial step in practicing to play bass guitar is to get acquainted with the notes of a rhythm guitar. If you are acquainted with the chords and notations, you can play single notes on a bass guitar rather easy. There are two kinds of bass guitarists. Those people who shift from acoustic to bass or electric guitar, secondly those people who grasp the bass guitar notes the moment they come across it. Both types of people gradually inculcate unique playing techniques, each different in one way or another. What this writes up is for those guitarists who are well acquainted with the bass, but require a platform, to begin with, chords. You have two options. You could either play a bass string by finger plucking which is generally the style of most of the bass guitarists or you could use a pick specially made for bass guitar. While striking the chords, you could shift to pick if at all you have been using the finger pluck method, but at the end of the day, your comfort level must make a choice. There are plenty of innovative techniques that are used while playing bass guitar. Like pulling, tapping of slapping the guitar. When slapping or tapping requires no pick, you would need one while you are playing your chords. If you have a hand that frets, you must stick on to solo notes in the fretboard, different when compared to the notes of the rhythm guitar. 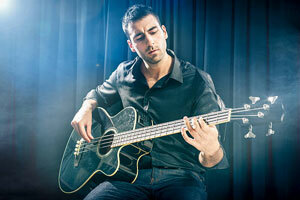 Nonetheless, professional guitarists are experts in the methods of using chords of the bass guitar. A lot of experiments have been done on beginners’ bass chords. If you plan to play chords on a bass guitar, don’t forget that the notes are in resemblance to how you will be using a rhythm guitar to play Barre chords on strings. The explanation given in the following will assist you in comprehending the basics of chords of the bass guitar. Just a single lesson from a specialist bass teacher is enough to take you on the right track! Dedicate sufficient share of time finding the right bass teacher who can make you affluent with the basics. Don’t just focus on the distance you would need to cover to reach them. Look for the teacher who is a real bassist at heart and can help you with adopting the right approach. No doubt, learning songs is an integral part of learning bass, but, strictly limiting yourself to the songs is useless. Make your goal to become a human bassline jukebox. You might feel like you are an expert once you learn to play a song. But that’s not it! You need to learn it inside out – see how notes are made and focus on other musical concepts. Focus on everything from harmony to melodies and rhythm – everything! Now that you know the basics of bass guitar learning go ahead!